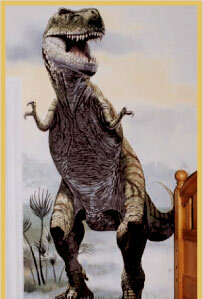 Artist’s Comments This T-Rex is a detail of a larger mural done for a child’s playroom. On the adjacent wall is a T-Rex approaching a herd of Triceratops. Many Moms ask, “Isn’t it scary?”, but I’ve never met a boy who didn’t love a dinosaur mural.